New proprietary phishing study of six million users shows insurance organizations and not-for-profits lead all other industries with greater than thirty percent of users falling for baseline phishing tests. 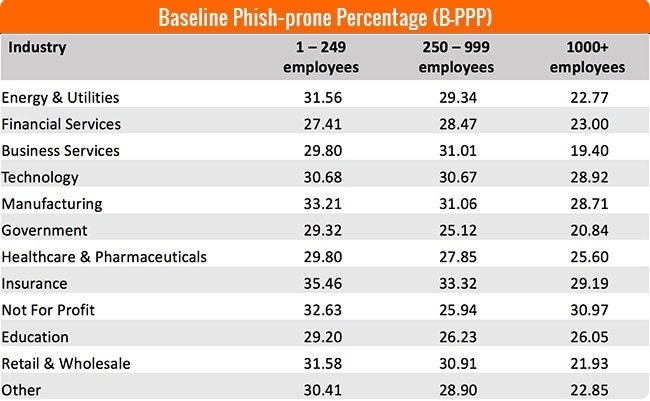 KnowBe4, provider of the world’s largest new-school security awareness and simulated phishing platform, released a breakthrough study of phishing statistics for top industries, showing small insurance companies have the highest percentage of “Phish-prone” employees in the small to mid–size organization category. Not-for-profit organizations take the lead in large organizations (1,000 or more employees). The study shows these types of organizations rank higher (in the low thirty percentiles) than the overall average of twenty seven percent across all industries and size organizations. Large business services organizations had the lowest Phish-prone benchmark at nineteen percent.